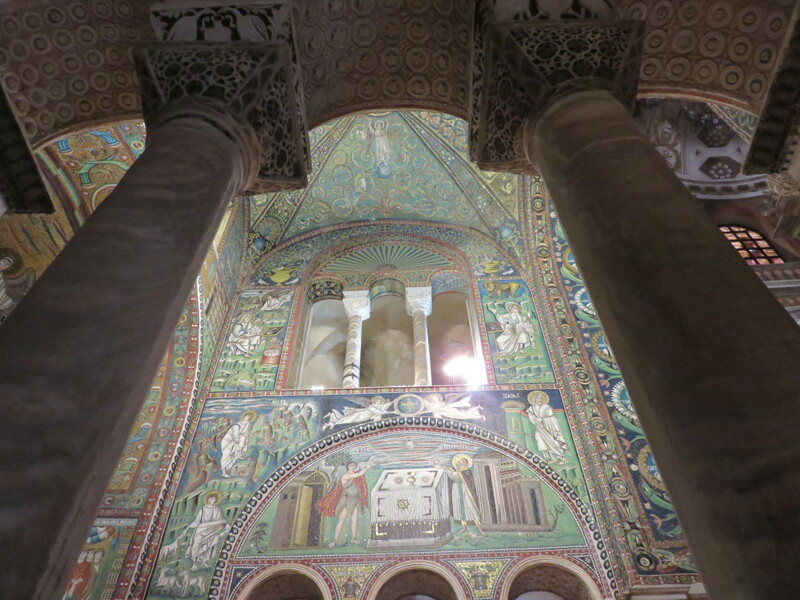 After studying iconology and Eastern Orthodox iconography for 10 months during the last school year, I decided to spend three days in Ravenna, Italy. 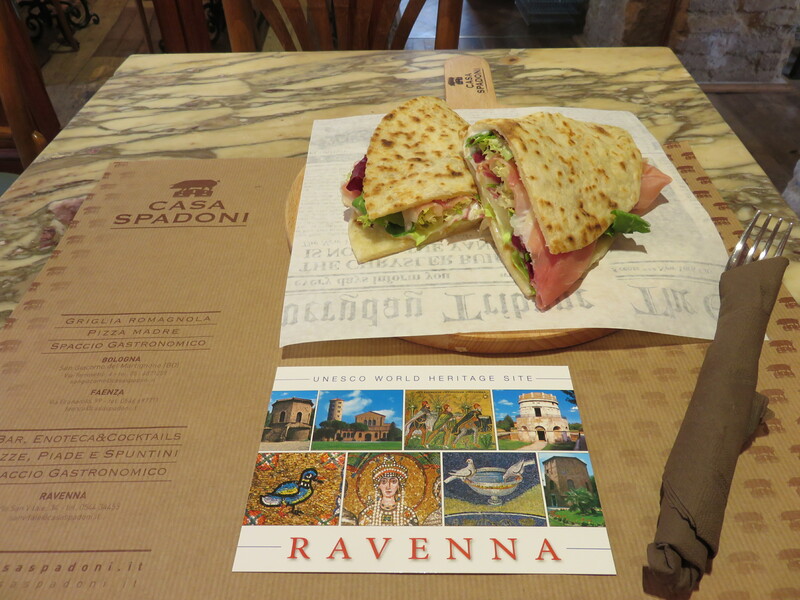 It is a fascinating town. 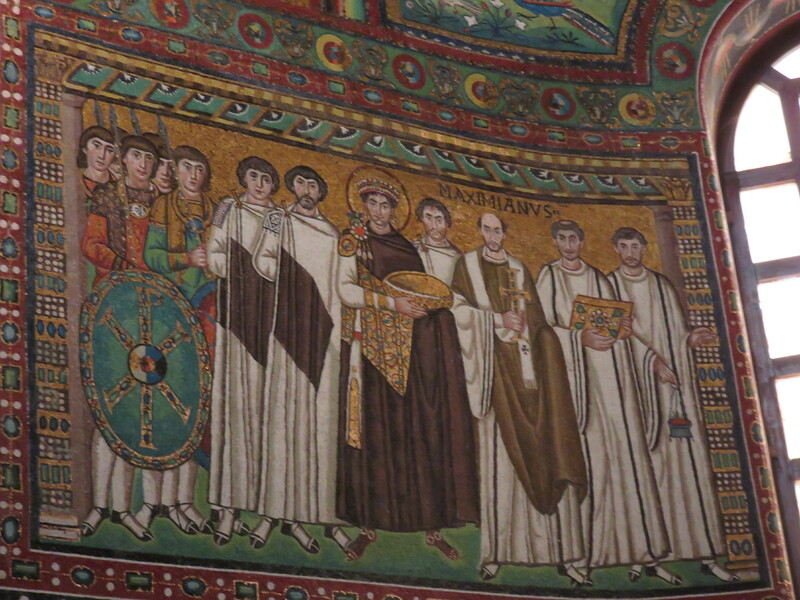 “The site is of outstanding universal value being of remarkable significance by virtue of the supreme artistry of the mosaic art that the monuments contain, and also because of the crucial evidence that they provide of artistic and religious relationships and contacts at an important period of European cultural history”. 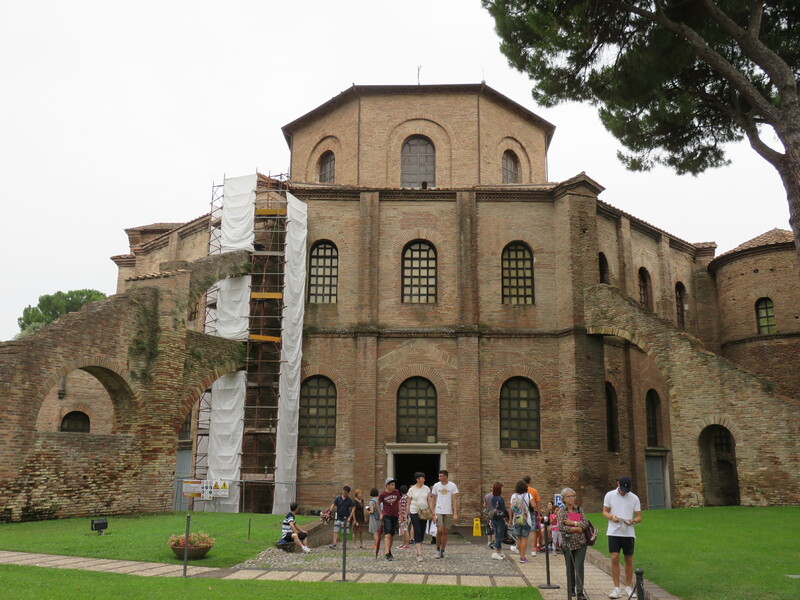 Consecrated in 548 AD, it is one of the most important monuments if the Early Christian art. 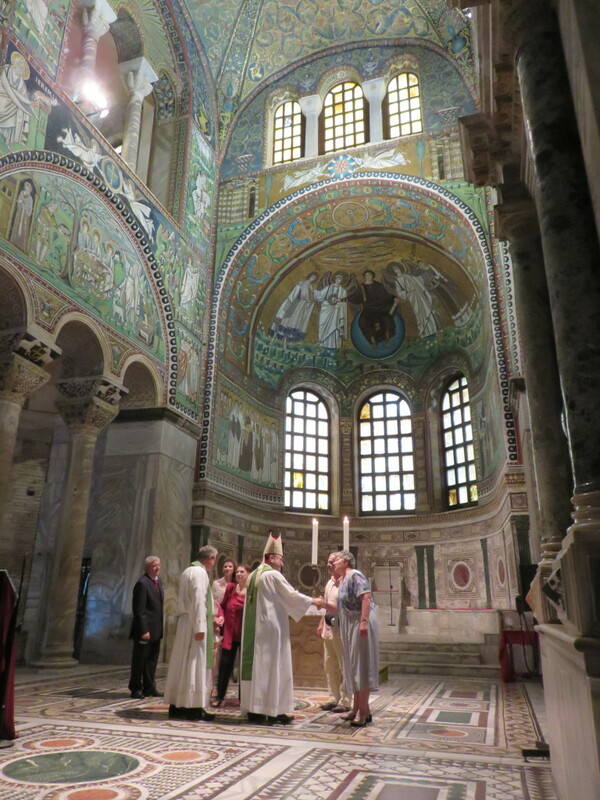 The eastern influence has a dominant role here: no longer a Basilica with nave and three aisles but a central octagonal plan topped by a large cupola. 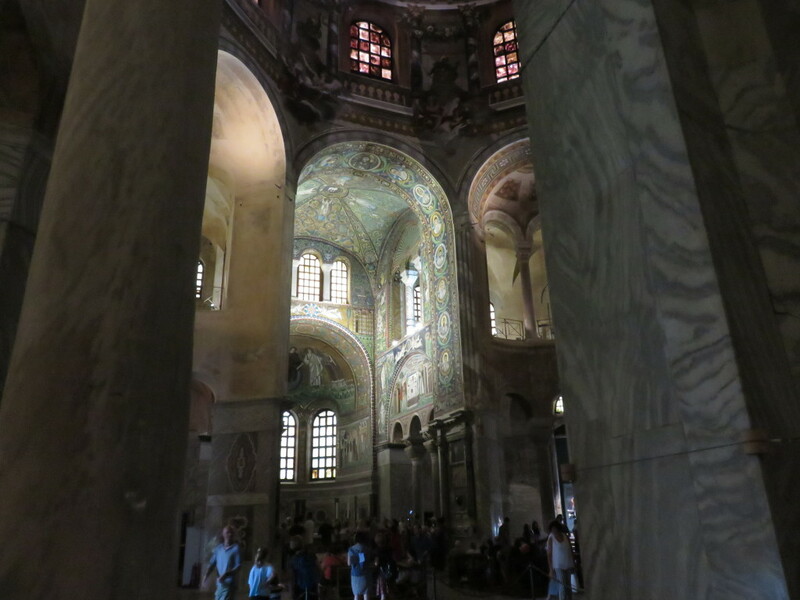 Inside San Vitale, the eyes are drawn up to the mosaic decorations of the apse with the extraordinary representation of the Byzantine imperial couple, Justinian and Theodora. 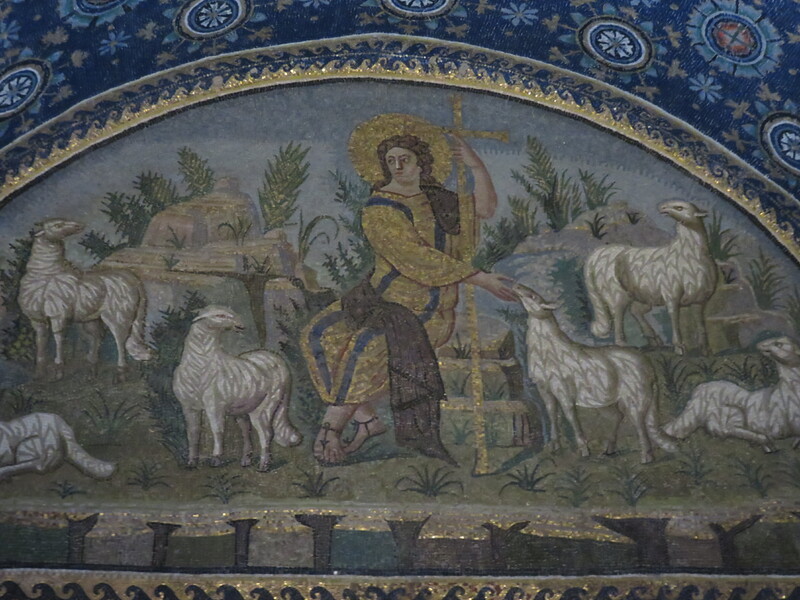 In the centre we see Christ seated on a blue globe with four fountains springing from the rock beneath it. 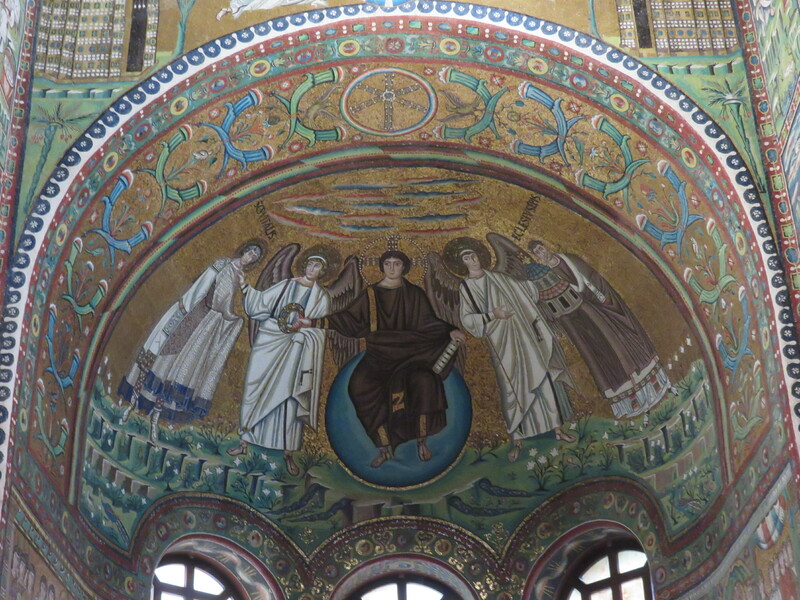 In his right hand he presents a precious crown to San Vitale, who is accompanied by an angel. Very little is known about San Vitale. 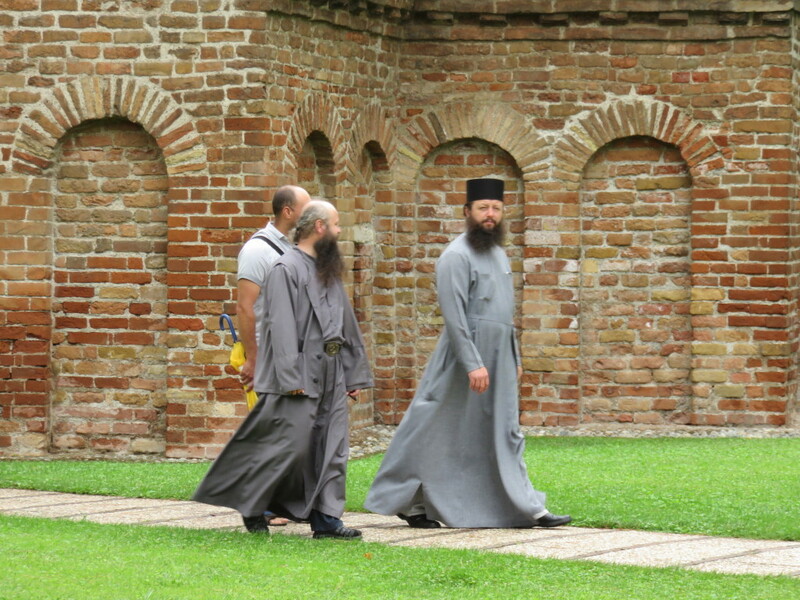 Legend has it that he was a Roman soldier martyred during the early Christian persecutions. 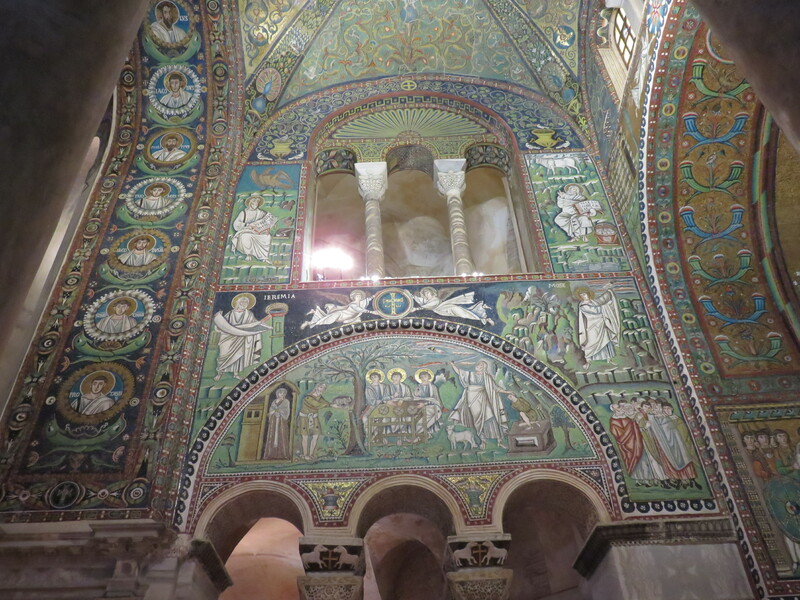 On each side there are two imperial mosaics. 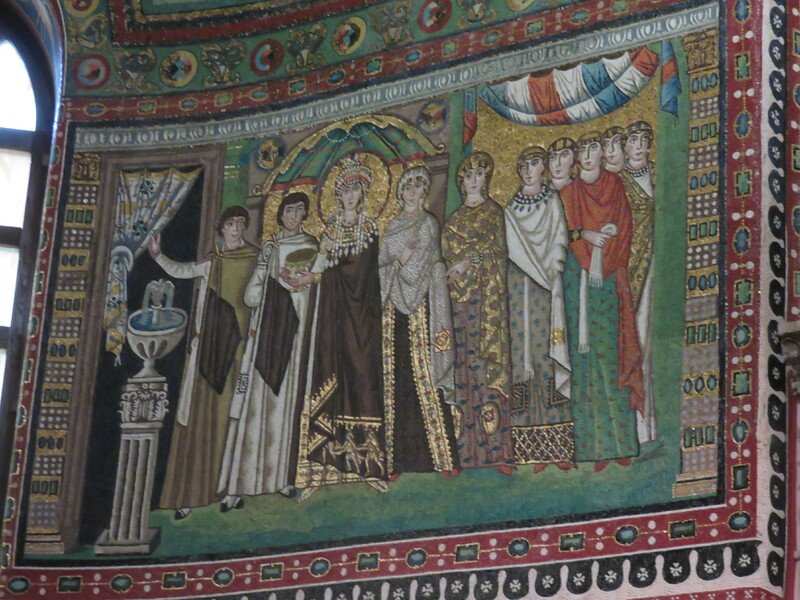 On the right, the empress Theodora is accompanied by two Court dignitaries. The hem of her purple gown shows the three wise men offering their gifts, just as she is portrayed here offering a large golden chalice. 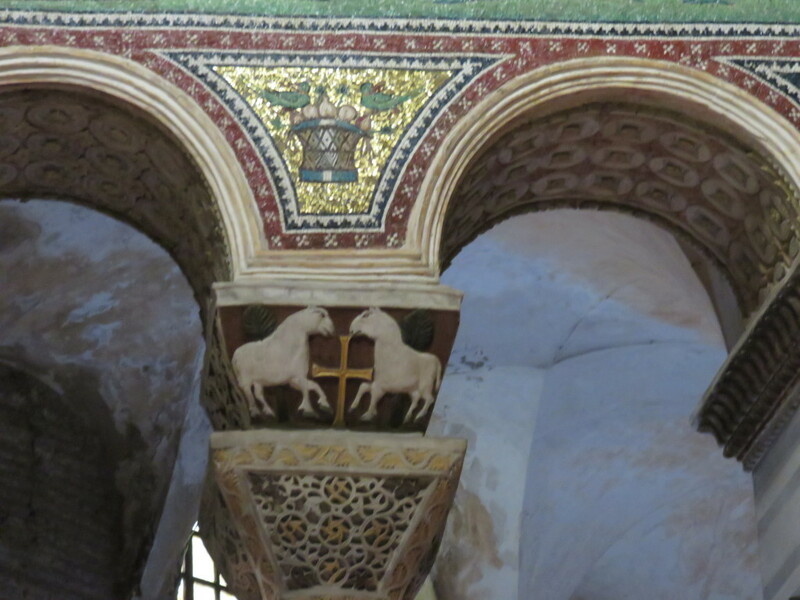 Opposite, on the left, we have the scene of the emperor Justinian’s gift: a large, gilded paten. 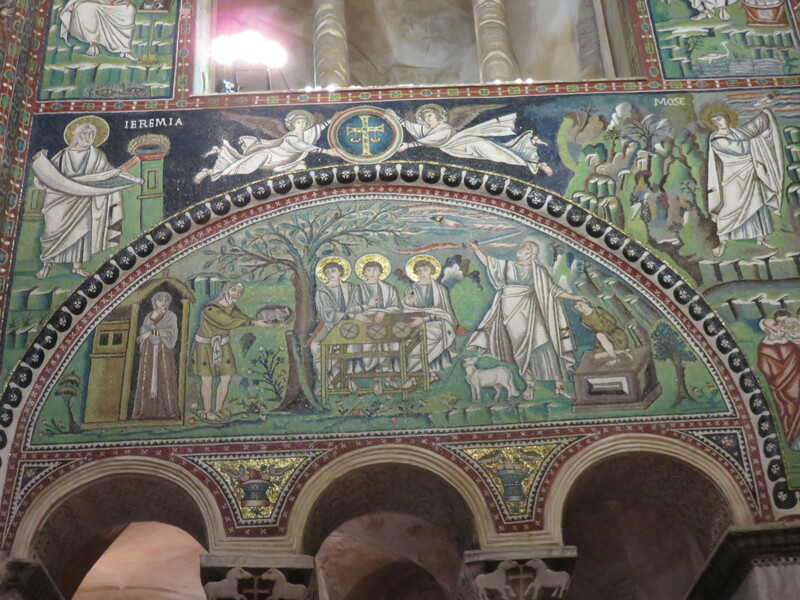 The lunette on the left illustrates two events in the life of Abraham: the meal which Abraham offered to the three visitors and the sacrifice of Isaac. On the right side, the lunette shows Abel offering a lamb and Melchidezek making an offering of bread. 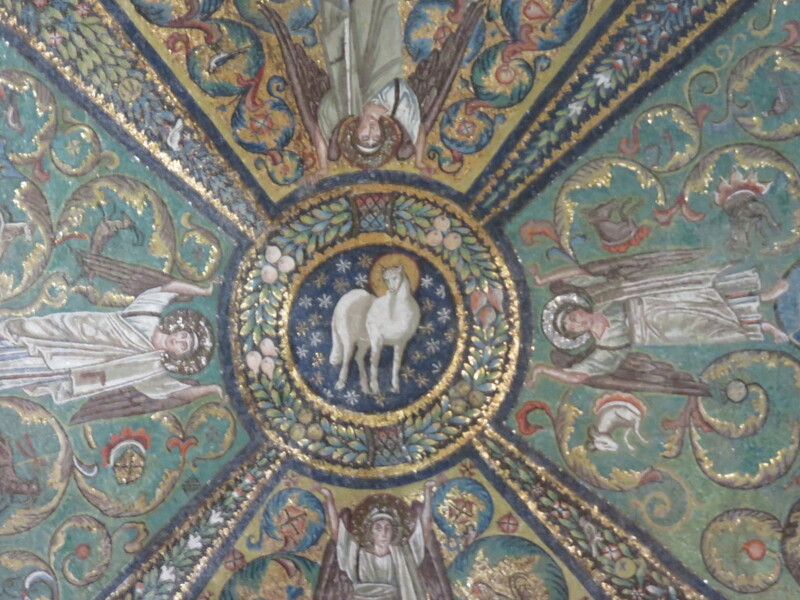 The altar is obviously the focal point of the picture; the heavens open above it and the hand of God appears from the clouds as a sign of acceptance. 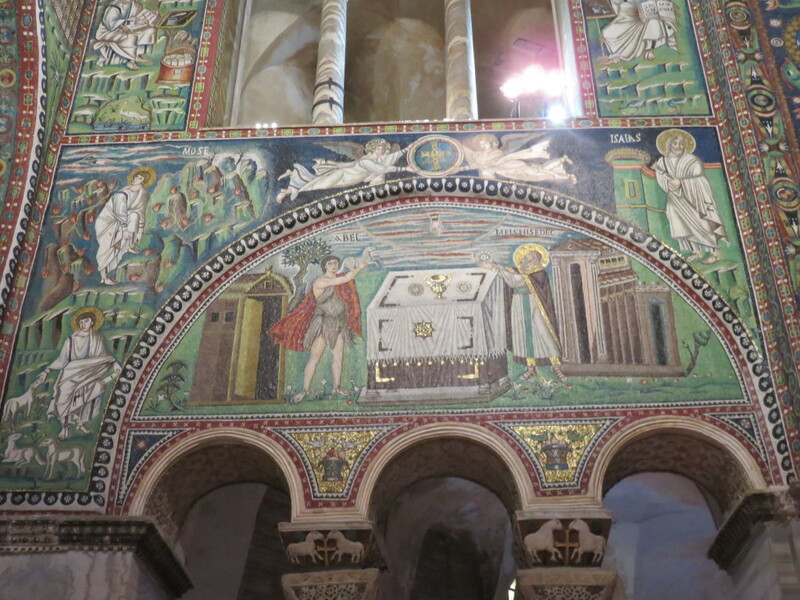 When we look at all these mosaics we should remember that they are from the 6th century AD!!!! 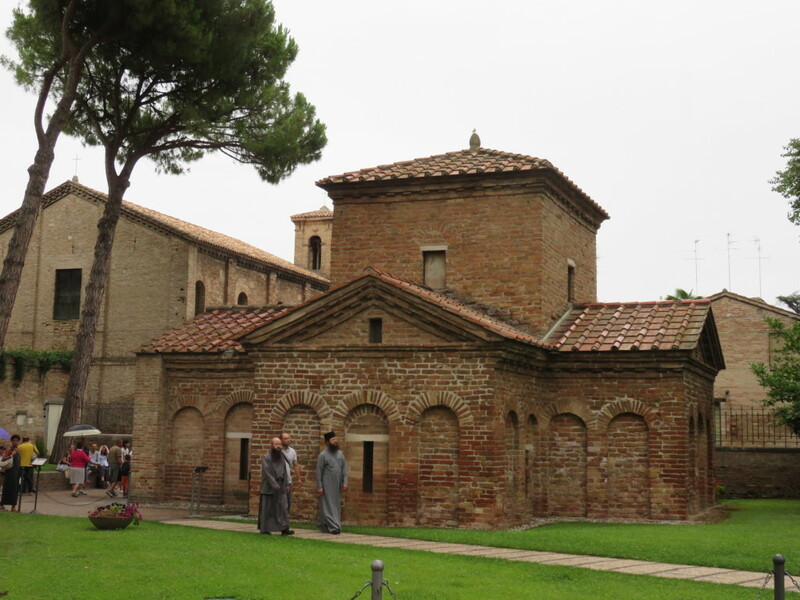 Not far from the Basilica of San Vitale is this small mausoleum. My guide book says that this mosaic is one of the finest examples of Paleo-Christian art. 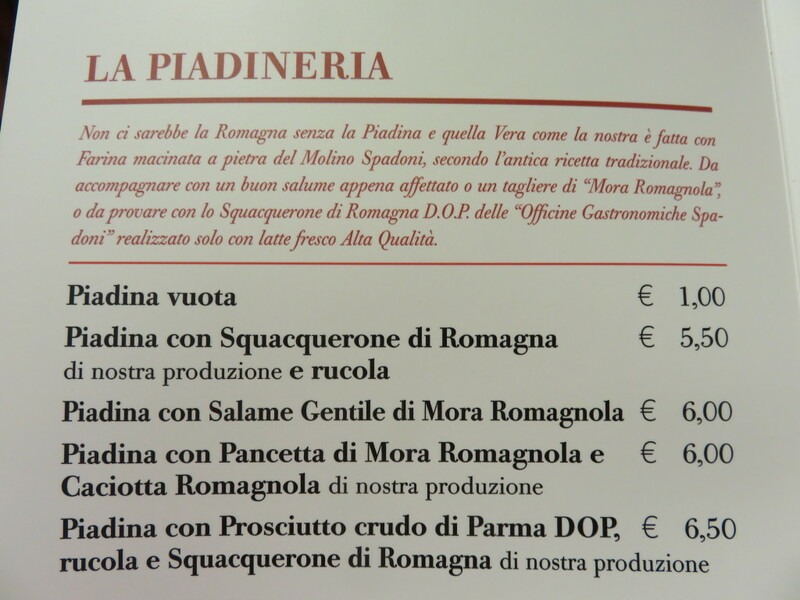 And now, time for lunch. 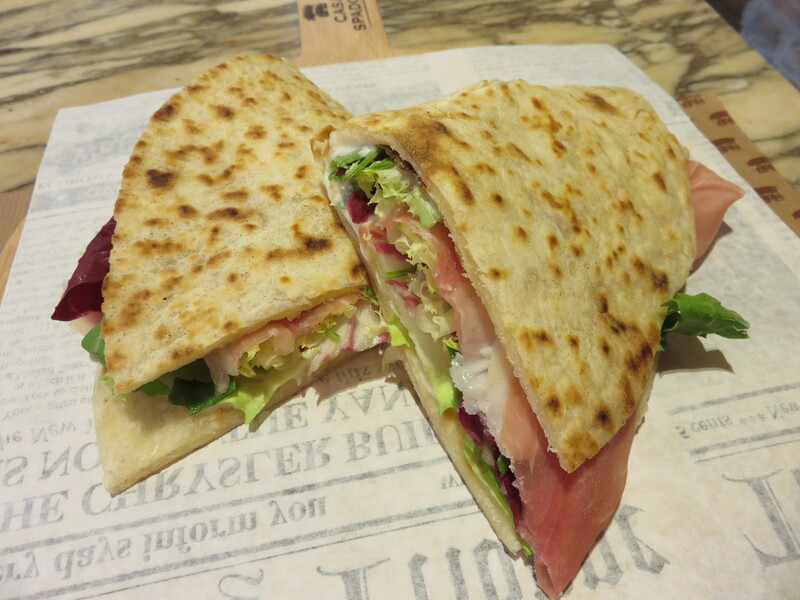 Today’s local specialty is piadina. 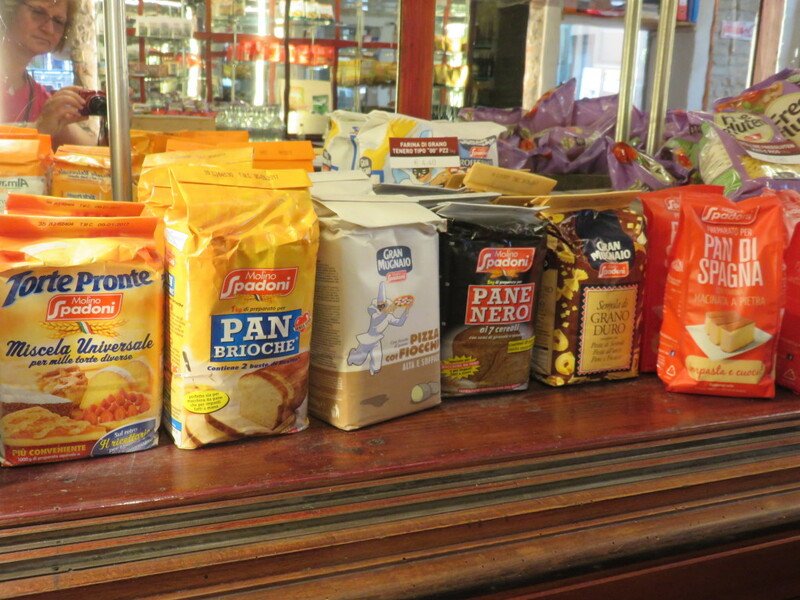 You can also buy flour in this restaurant, the selection is amazing.